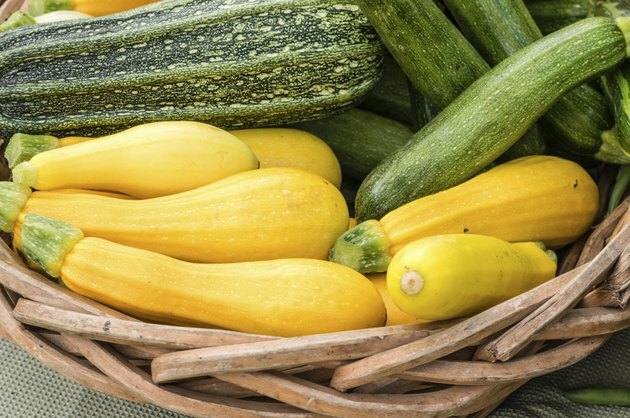 Yellow squash is a form of summer squash and includes several crookneck and straightneck varieties. These vegetables grow in many areas of the United States and, when in season, you can usually find yellow squash at local farmers markets, roadside fruit and vegetable stands and grocery stores. Yellow squash is a versatile vegetable that delivers several nutritional benefits and is used in many types of dishes. Yellow squash is exceptionally low in calories, with approximately 20 calories in a small-sized vegetable and 30 calories in a medium-sized vegetable. The few calories in yellow squash come primarily from the carbohydrate content, which is also low. A 1-cup serving of sliced, yellow squash contains approximately 4 grams of carbohydrates. Yellow squash is a good option to replace high-calorie vegetables, such as potatoes and corn, in your nutrition plan, especially if you are trying to reduce your daily caloric intake. Like most vegetables, yellow squash contains little fat and no measurable cholesterol. A small yellow squash, or 1 cup of sliced squash, contains approximately 0.2 grams of fat; a medium yellow squash contains roughly 0.4 grams. Healthful options for preparing fresh yellow squash include grilling, baking and steaming without added fats. Limiting your intake of fats and cholesterol is an important step to help reduce your risk of heart disease. Adding yellow squash to your nutrition plan provides you with a source of moderate levels of dietary vitamin C. A 1-cup serving of sliced, yellow squash contains approximately 19 milligrams of vitamin C. Your body needs vitamin C to form collagen, which is found in your skin, blood vessels, joints and bones. Vitamin C also helps you fight infections by supporting your immune system. Iron and folate are commonly found in high concentrations in meat, eggs and other animal-derived foods. Yellow squash is an alternative vegetable source of these nutrients. A cup of sliced yellow squash provides you with approximately 0.5 milligrams of iron and 35 micrograms of folate. Your body requires iron and folate to maintain a normal rate of red blood cell production and prevent anemia. Folate is also important during early pregnancy, supporting the normal development of the fetal brain and nervous system. Yellow squash contains high concentrations of beta carotene and lutein. Beta carotene is an antioxidant that helps protect your body against damage from pollutants and chemicals called free radicals. Dietary lutein may help prevent the development of cataracts and the age-related eye condition -- macular degeneration -- which can lead to blindness. A cup of sliced yellow squash provides you with roughly 135 micrograms of beta carotene and 2,400 micrograms of lutein. Add diced or shredded yellow squash to stews, salads, casseroles and soups to increase your intake of this nutritious vegetable.